John Wilson and John Wessler only cut this one 45 but it’s become one of the key works in that fascinating sub-genre, the soul of Vietnam. Whether it's the powerhouse vocals or the busy guitarist there are so many things to admire here. A really heartfelt plea from the battlefield this – a superb record. 1. 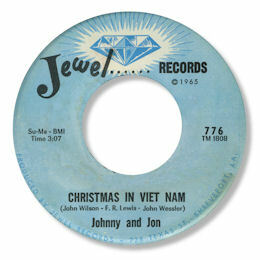 You can find "Christmas in Viet Nam" on the Westside UK CD "Soul Jewels Vol 1". 2. You can find many more soulful Christmas tracks on this fine article by Karl Tsignidos here.